As we hurtle towards Christmas and New Year’s Eve, cooler climes have set in in many regions. If warm clothing is on your list, so is warm bed linen I assume. Move on from thin quilts and comforters to thicker ones. What comes to my mind is the picture of hot cups of tea, coffee and soup, or your favourite poison coupled with a book, while you are tucked comfortably amidst soft warm cushions. 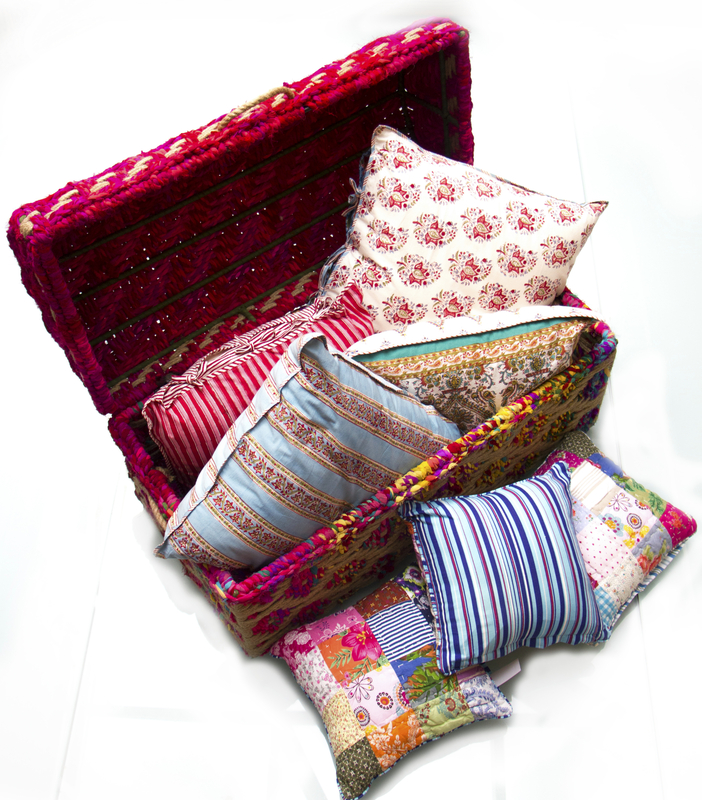 Pick your choice of handmade cushions and cushion covers from The Sandalwood Room. They come in pretty patterns of block prints in both vibrant blues and greens, or earthy shades. Don’t miss the draw-strings on the cushions ; tie them up in colours that match or contrast! 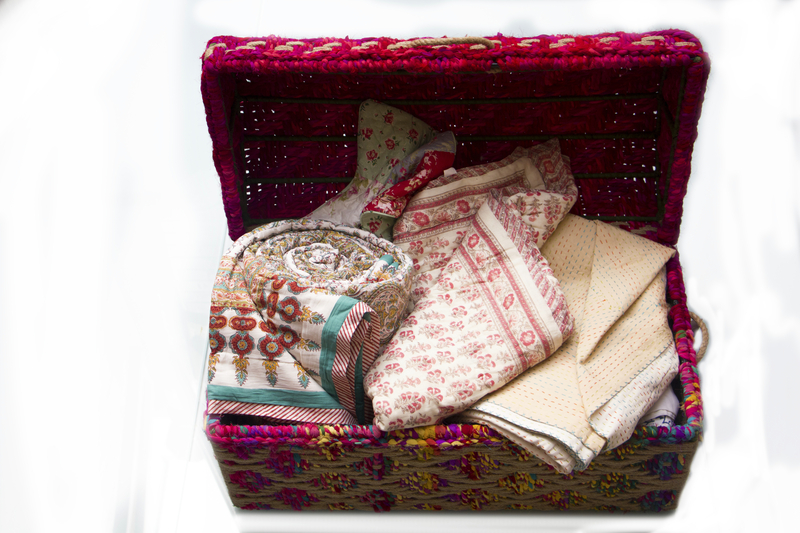 I have always wondered why patchwork is so sought after, be it on garments, or home linen. Probably because handcrafted patchwork is hard to replicate and is a mark of a vivid imagination. One can still tell the difference between mass made patchwork clothes (you can see them on the racks of the chain stores) and those stitched together from left-over pieces of fabric. There is a story of labour behind each piece of bed-linen at The Sandalwood Room. Some embroidered, some patch-worked, some with applique work and some others in single colours, but all of them spoiling you for choice. You can choose any pattern to match your home in modern, traditional or geometric motifs. Very few homes have just the bare number of cushions or quilts. And we are forever looking for spaces to tuck them in, when we play the ‘mix and match’ game. The Sandalwood Room has the perfect trunks to stash away all your linen. Light weight and easily movable, they make for good pieces of home décor too, while your quilts and cushions nestle within. Come to think of it, I can just about store anything in these trunks I guess. I know Singapore loves everything recycled. A national recycling programme was launched in 2001 in Singapore and the rate across all sectors grew to a 61% by 2013. 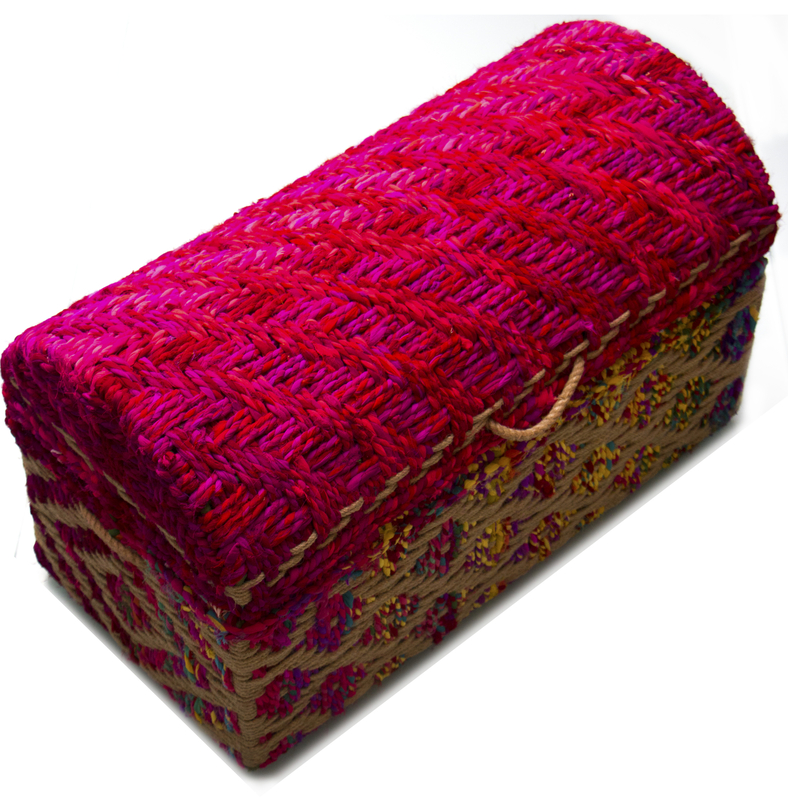 Rightly so, The Sandalwood Room introduced these multi-hued trunks that are made from recycled cloth and coir. 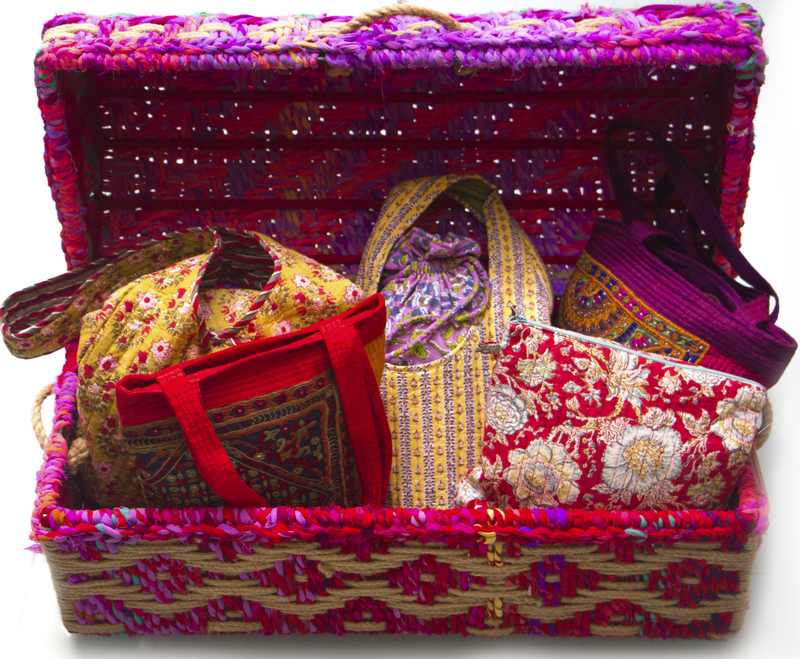 They are representative of the art of Rajasthan in India. The natural fibre coir and recycled cloth, after being dyed, are woven together tightly around metal frames to make a trunk out of them. I went visiting a friend in Singapore and was quite surprised to see this pretty trunk perk up the contemporary look of the study room. And we spoke about how home décor is all about being creative and different. So is fashion I would say. Would you team these irresistible shoulder sling bags with a western outfit, fashionistas of Singapore? Back in India, they are a rage. This one here , the trunk in shades of blue and indigo is however a little different from the coir one. 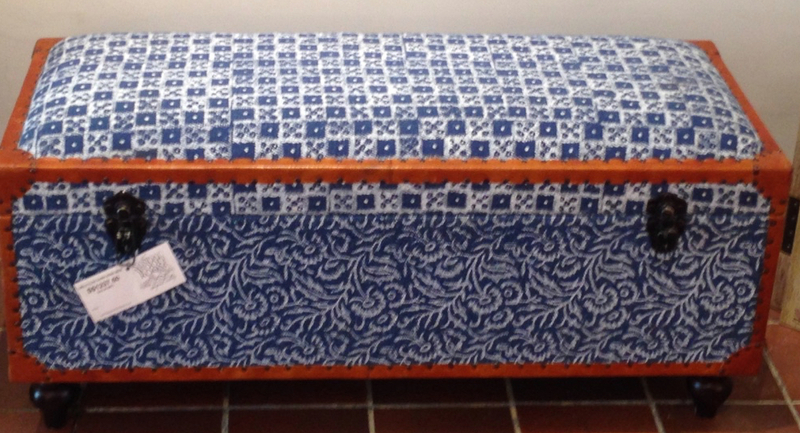 It is made from strong cotton fabric dyed in indigo and stretched over a metal frame with foam stuffing on the top, thereby lending itself to serve as a seat. Encased by leather and studded with rivets around the edges and corners, it seems well protected from accidental hits and nudges. Steel clasps to shut it tight. I would not relegate it to a corner, but place it midway against a wall well proportioned. Versatility is the hall-mark of The Sandalwood Room is what struck me as I browsed around, studying each piece of handcrafted art on their racks and shelves. A global feel too, I was gently reminded by Jay, the promoter of the boutique. Couldn’t agree with her more, what with collectibles, couture, jewelry, gifts, home decor and art sourced out from around the globe. Ciao till I come back soon. And oh, by the way, they have moved to Tras Street.